You can manage your products and services under "Products - Products". First go to "Products" in order to reach the overview of your products. Then click "New product". Enter a product's most important information here. The distinction between "Merchandise" or "Service" is mandatory and, once configured, cannot be changed. Fill out the remaining fields (Product code, Product name and Description) and assign the product to a group, if applicable. Any information entered here will also be printed on bexio documents. Here you define the purchase price or selling price. You have several different options: You can only enter the purchase price with a mark-up in percent %. The selling price and profit margin are then calculated automatically. In the example shown below, a purchase price of CHF 100.00 and mark-up of 50% were defined. Based on this, bexio then calculates a selling price of CHF 150.00 which corresponds to a profit margin of 33.3333%. You can also leave out this information and instead enter an individual price for the product when preparing an offer or invoice. Here you can define the product's other properties such as currency, VAT rate and unit of measurement. You can change these parameters in the settings as desired. Here you can enter a product's vendor details, i.e. the name and product code under which your vendor stocks the product. This information is used when you want to use bexio to send a purchase order or invoice to the vendor. Vendor purchase orders, however, are only offered with the "Business Trade" package. 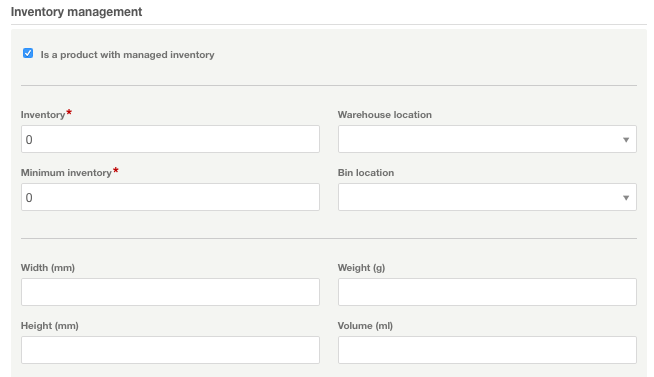 Checking the "Is an in-stock product" option will configure the product as an "In-stock product". A minimum inventory level as well as an initial inventory must be entered for in-stock products. You can also provide additional details about the product's warehouse location and dimensions. The functions linked to "In-stock products" (inventory overview, postings for incoming/outgoing goods, purchase orders) are only available with the "Business Trade" package.